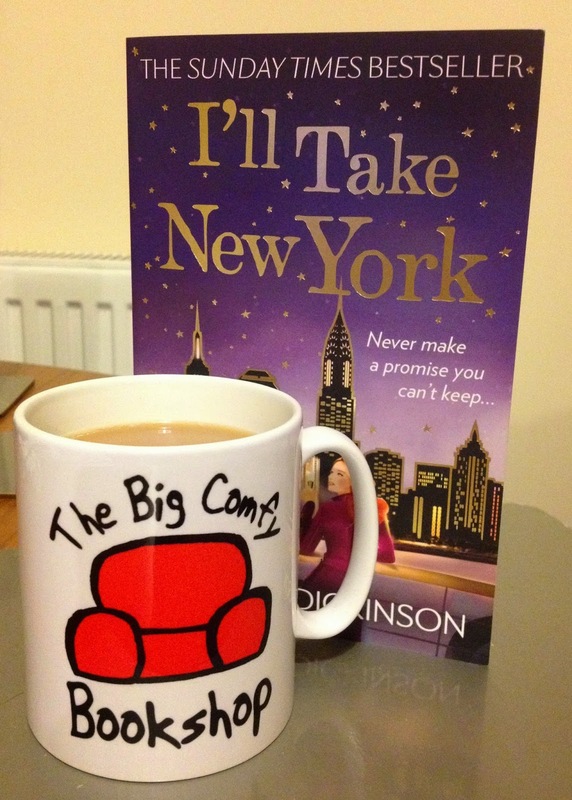 From the very beginning of this blog there have been certain constants: my obsession with bookshops, my excessive book-buying habits, my cat, and a big comfy armchair. Three of these things rule my life, the fourth has been a friendly presence, inviting me along for a visit since before it even had a physical bookshop to live in. Okay, so technically it wasn't the armchair that extended the invitation, but it was certainly a part of the offering whenever Michael from Big Comfy Books tweeted a hello. 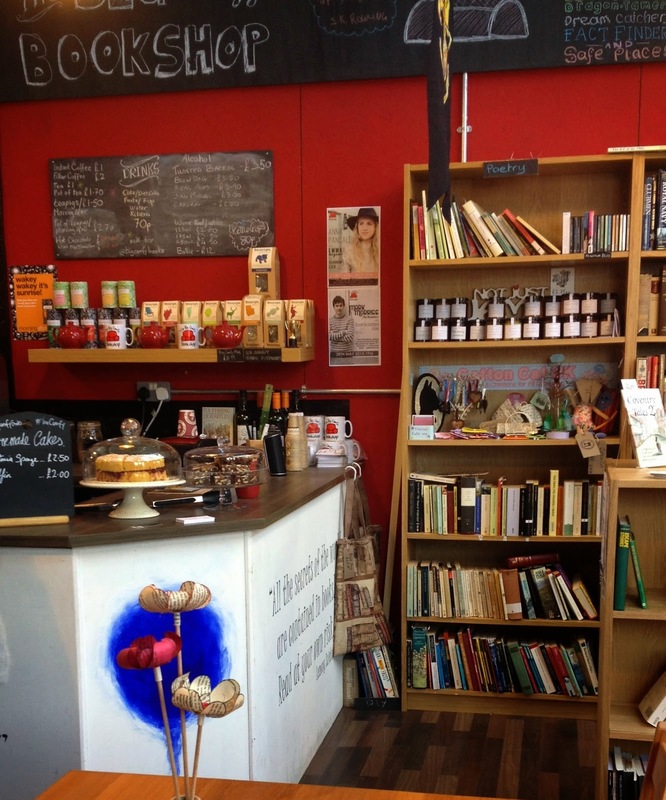 Back in the early days of this blog the bookshop still had a long way to go before it joined the real world, but I enjoyed following its progress and was particularly disappointed when I was unable to make the opening in late 2014. Then, finally, I found myself vaguely north of the Watford Gap and knew this was my chance to meet The Big Comfy Bookshop and finally experience that big comfy armchair for myself. Cheating and relying on SatNav, the car park for the creative village it lives in is surprisingly easy to find. Still a work in progress, the entry to the 'village' is surrounded by striking artwork. I'm not here to write about the bookshop's home, but from what I saw I'd certainly recommend a visit to explore the many other outlets that make up Fargo Village. 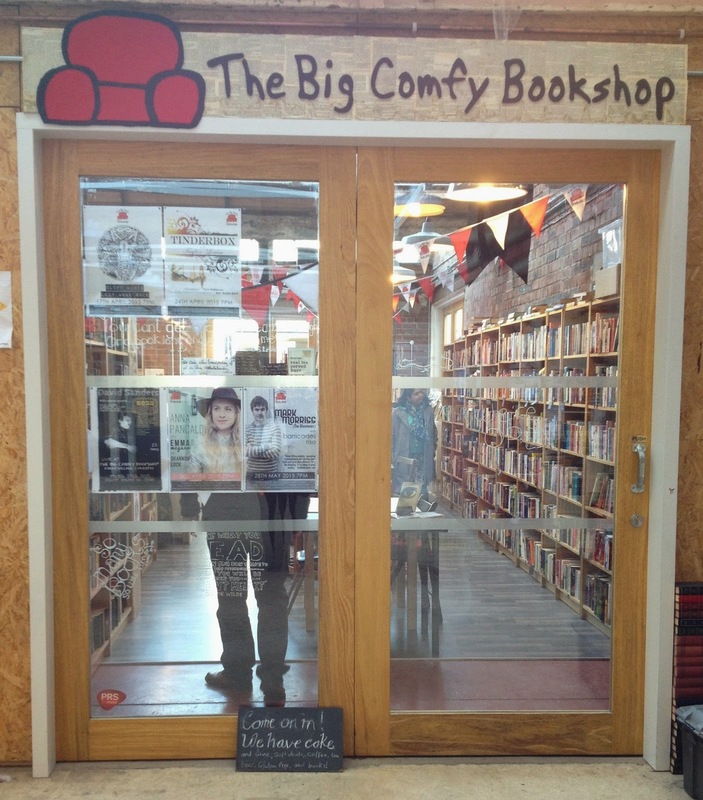 The Big Comfy Bookshop is easy to find, with a big red armchair painted on the wall outside so that even the non-bookish must be encouraged to look inside. Once through the door they'll find a reasonable-sized room, lined with bookcases, lightly sprinkled with tables and chairs and the big comfy armchair and sofa. A good range of secondhand books lines the walls, including fiction and non-fiction, with everything from modern classics to everyday reading to the pulp novels some would consider too low-brow to own up to. That's the beauty of The Big Comfy Bookshop: All are welcome here. During my Sunday stay a steady stream of customers passed through, picking up books, stopping for cake and a cup of tea and generally making the most of their surroundings. Visitors ranged from a family to friends catching up to waifs and strays such as myself, including another Twitter acquaintance of the bookshop, a musician who'd also randomly decided to drop in (and whose music I've now become a fan of). So what's the secret of Big Comfy's popularity in such a short space of time? Well apart from the obvious – it's a very good bookshop – I'd say it's also down to the fact bookseller Michael, who's generally to be found behind the till, is such a great bloke. Friendly, welcoming, happy to leave customers be or join in the conversation, I found myself chatting to him for a good couple of hours and could easily have stayed for longer. 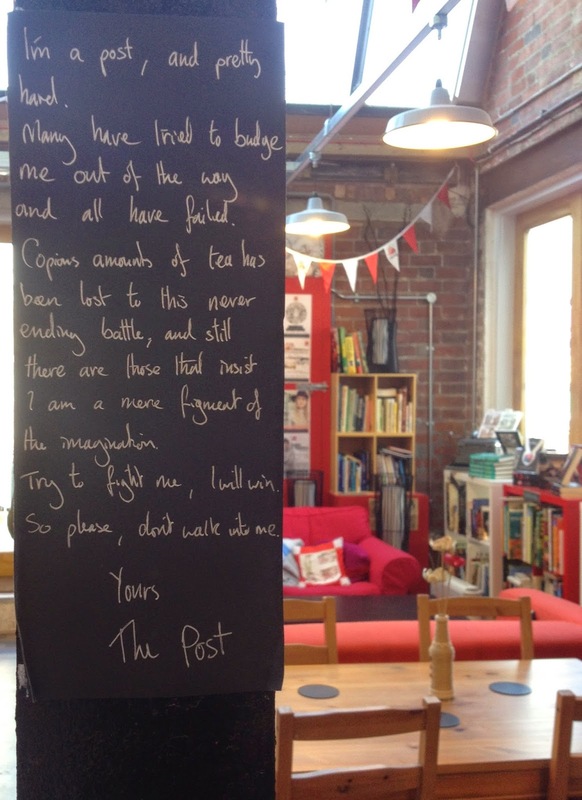 While I was there we talked about the bookshop itself and how he's really taken to his 'big comfy' brand: the armchair may be the icon, but it embraces Big Comfy Sessions and all the music events they involve. Music is a big part of this bookshop, and it fits in perfectly. The name doesn't stop there, with Big Comfy Conserve among the bookcase of local crafts and preserves; and even the possibility of Big Comfy Beer in the future. In short, Michael's enthusiasm for the bookshop and everything it involves is clear. Returning to the books, some truly inspired comments adorn the fiction shelves, including a reference to one author which ends: "then he* wrote books which are also good. Mostly." Such honesty has to be applauded and certainly made me giggle as I sought out other recommendations and quotes along the shelves. Naturally drawn to the great selection of sci-fi (especially some older classics) I spent a long time dithering over which I should buy, before being swayed by the highlights table where Miranda Dickinson's I'll take New York was on display. Not an author I've read before, I follow her on Twitter and this continued theme of social media acquaintances – along with the chance to pick up a signed copy – swayed me to select her book over the rest. I also picked up a Big Comfy Mug before finally, reluctantly, making my way home. The Big Comfy Bookshop may still be comparatively young, but it already feels like it's found its place within the community. My only complaint? I was so busy enjoying the bookshop proper I forgot to actually sit on that big comfy armchair – I'll just have to wait until next time. Thank you for your comment. I've unfortunately recently been targeted by spammers, so I've had to put a limited amount of moderation on comments for the time being. If you're a human, your comment will be uploaded soon. Find out what this blog's all about in the first post. If you'd like to sponsor me in aid of Hospice in the Weald, that would be nice too. Have you met The Gruffalo? What difference can one person make? The best way to keep up-to-date with the bookshop blog is to click on the follow thingymajig top right, but if that's not your thing I'm also on Twitter, Facebook, Instagram, Google+ (when I remember) and Pinterest.